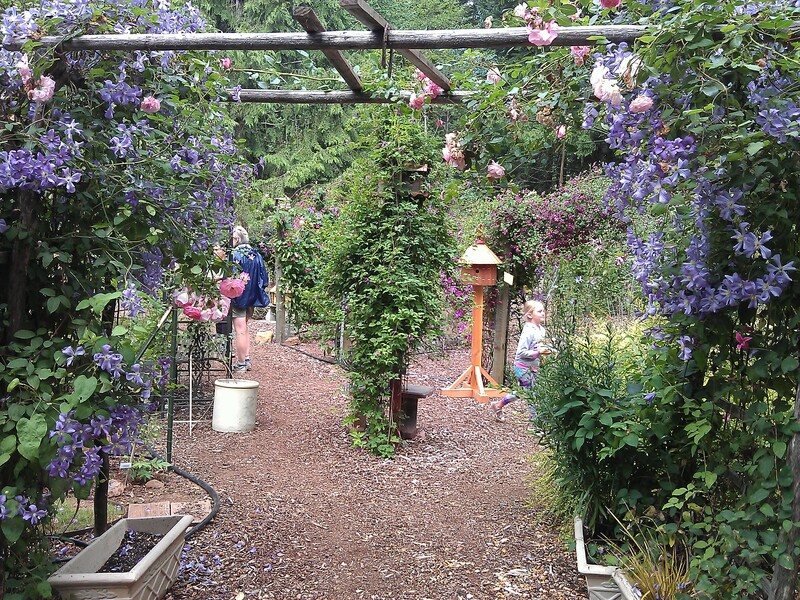 On Saturday, May 28, the Rogerson Clematis Collection, just south of Portland in Lake Oswego, will put on their 9th Annual Inviting Vines Garden Tour. If you love clematis and are anywhere near Portland, Oregon, this is an event you should not miss! You will see clematis galore and even be able to buy them. I have enjoyed all but one of the tours over the years–and will be attending this one, too, along with a couple of friends. Maybe a clematis or two will even hop in my car. 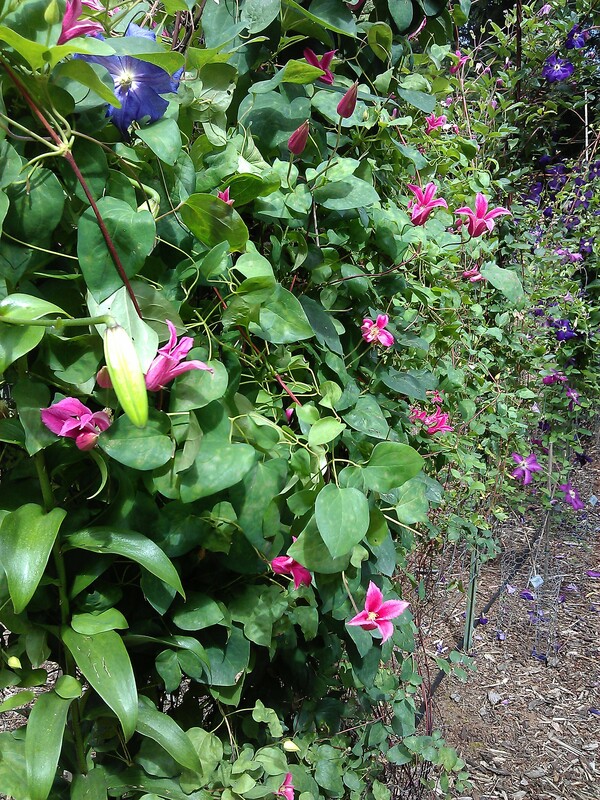 I have been to two of the three gardens on the tour–the Rogerson Clematis Collection and the Tuttle Garden. 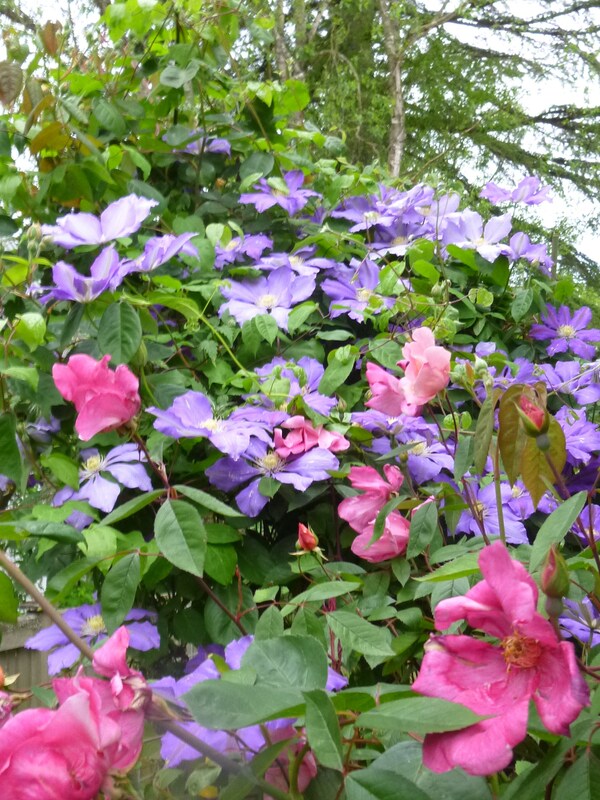 Both are outstanding and both have literally hundreds of clematis, though of course not all in bloom at once. The third garden, Ainsworth House, sounds fabulous, too. 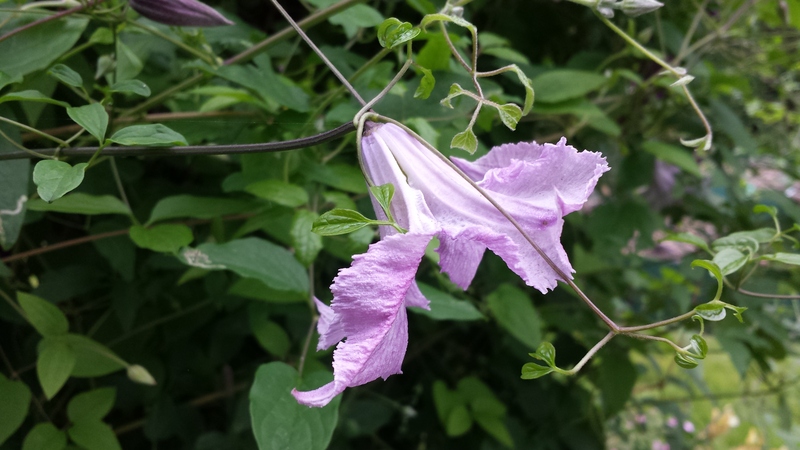 Join us again for our much anticipated 9th Annual Inviting Vines garden tour event that this year includes two private gardens, and the Rogerson Clematis Garden at Luscher Farm. 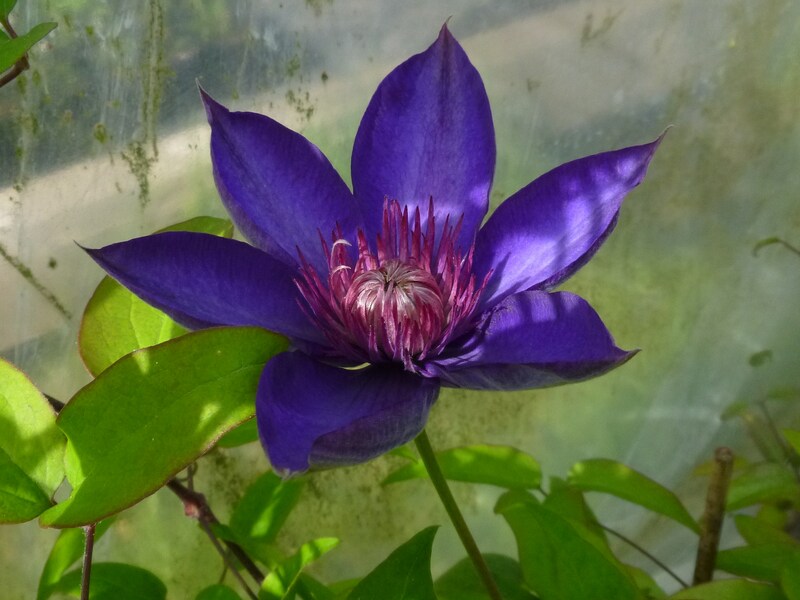 This is a day-long special garden event that includes tours, refreshments, and lectures highlighted by conversations and strolls with two gardeners passionate about clematis in their gardens and how to grow and display them in your garden. Inviting Vines is a special way for you to spend the day with “old” friends and make new ones. We love having the chance to visit with you all day long at our own event. This is a wonderful way to spend the Saturday of Memorial Day Weekend. Tickets are $20/person and include access to the gardens (including detailed driving directions and garden descriptions), refreshments and lectures. You can see more about the gardens on the tour and purchase your tickets from the Rogerson Clematis Collection online here. Tickets purchased online from the Collection before Tuesday May 24th will be mailed to you to the address on your order. Tickets will also be available through the day of the tour at Portland Nursery, The Garden Gallery in Hubbard, Dennis’s 7 Dees, Garden Fever, 13th St. Nursery in Salem, Joy Creek Nursery in Scappoose and Gardener’s Choice in Tigard. Below are a few clematis you just might see on the tour. May Winner–Clematis Cezanne adorning an oversized windowbox. 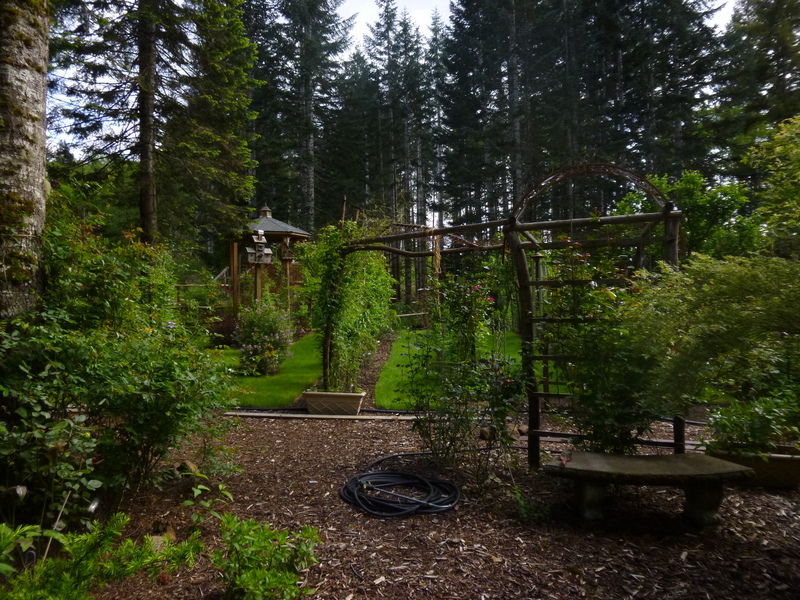 AT LAST–NORTHWEST FLOWER & GARDEN SHOW HAS ARRIVED! My very most favorite Display Garden at the Show–West Seattle Nursery’s south west desert. It literally stopped me in my tracks–I love it!! Opening day for the renowned Northwest Flower & Garden Show was today, and I was there! This Seattle show is the 2nd largest flower show in the US and 3rd in the world (after the Philadelphia and Chelsea Flower Shows)! I wandered around all day in bliss, soaking up the sights, sounds, and smells of blooming gardens, visiting with gardening friends, and listening to three delightful talks! Since seeing everything in one day is completely impossible, I will return tomorrow to make sure I don’t miss anything. I will start at 7:30am at the Flower Show’s Tweet-Up for Twitter users who sign up ahead of time. We get treated to coffee, pastries, and a great swag bag. THEN we get to photograph the Display Gardens for nearly 1 1/2 before the public arrives and with all the lights still on. Can’t wait! I’M SPEAKING ON FRIDAY, 6:45PM! Then I come again on Friday! If you are in the Greater Seattle area and have the time and inclination, come hear me speak on Friday, 2/19, at 6:45pm in the Hood Room. I will be talking about Growing Clematis in Small Spaces and showing inspiring photos of small clematis. I’d love to see you there! I have much exploring yet to do, but I have already spied clematis! Clematis REBECCA is blooming away in the Monrovia Booth (and they have plants for sale, too). 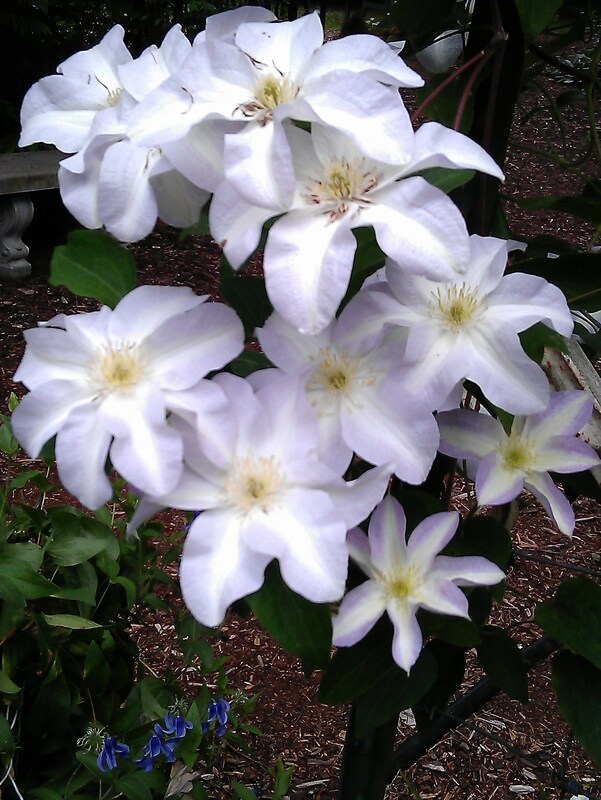 Click link to get more details about this clematis. The delightful and delectable Clematis REBECCA at the Monrovia Booth. Sundquist Nursery has nine (count ’em, nine!!) different clematis for sale at their booth! I don’t even have four of them. Funny thing, I found those four clematis in my backpack when I got home. I’ve NO IDEA how that happened! A big note of caution, though. These plants are very young rooted cuttings, packed bare root. If you purchase one (I think they are about $12), please plant it in a smallish pot ASAP, keep it watered very well, maybe even once a day until you see new growth, then water normally (i.e., when the top inch or so of soil dries up a bit). Because they are so young, grow them on in pots, potting up to a larger size once or twice, for at least a year. Very young clematis planted directly in the ground often just melt away, never to be seen again. 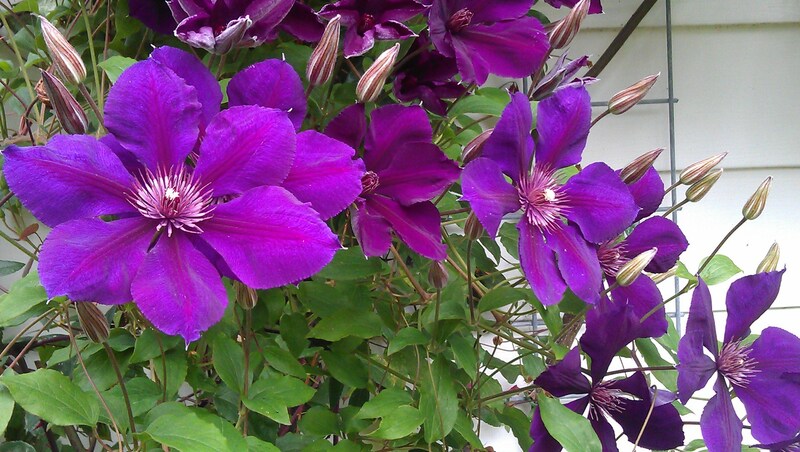 *These clematis showed up at my house somehow. 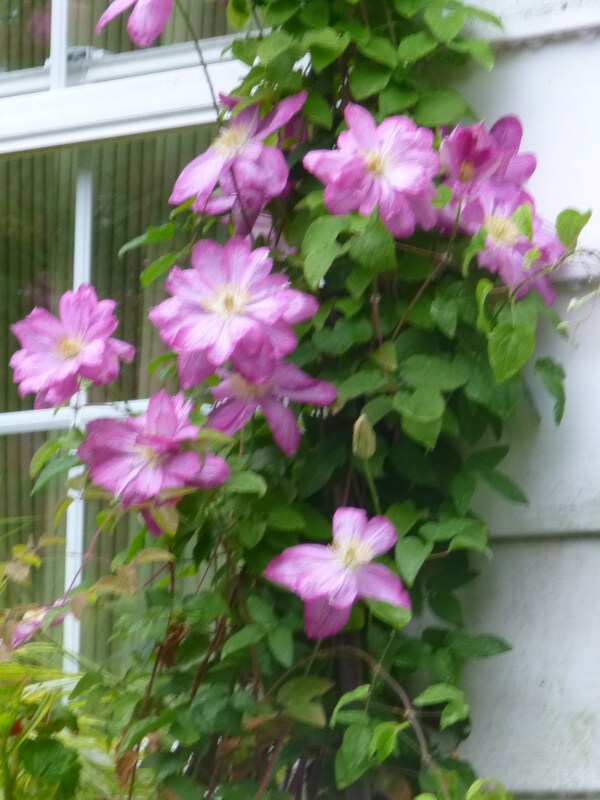 Clicking on a clematis above will take you to great information and a photo of that clematis on Clematis on the Web. So come on down to the Northwest Flower & Garden Show and see the display gardens, shop at the three large market places (including the plant market and the Vintage Market), and listen to one or two of the 100 speakers at the show! Maybe I’ll see you there. 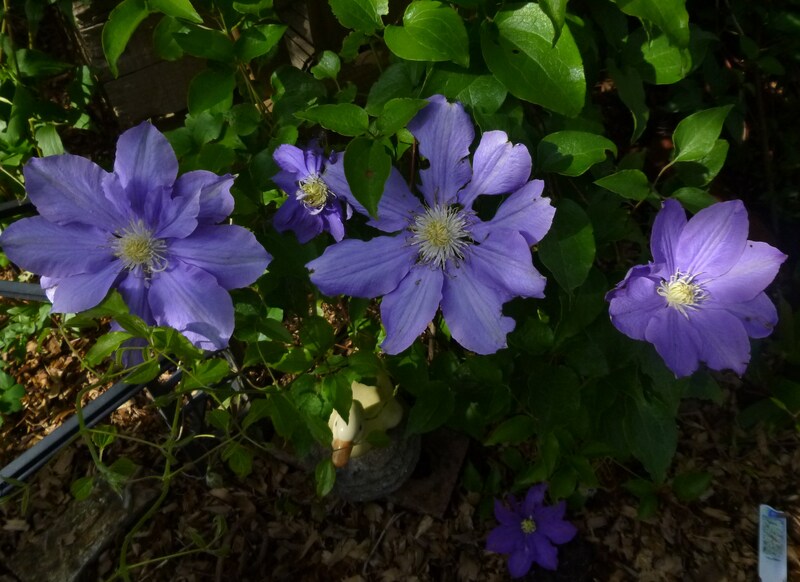 In my garden the June Clematis of the Month is actually a pair of clematis, one French and the other American: C. Etoile Violette and C. Betty Corning. C. Etoile Violette, hybridized in the late 1800s by a French nurseryman, is a luscious dark purple with faint hints of a red bar. It’s French name means Tower of Purple. 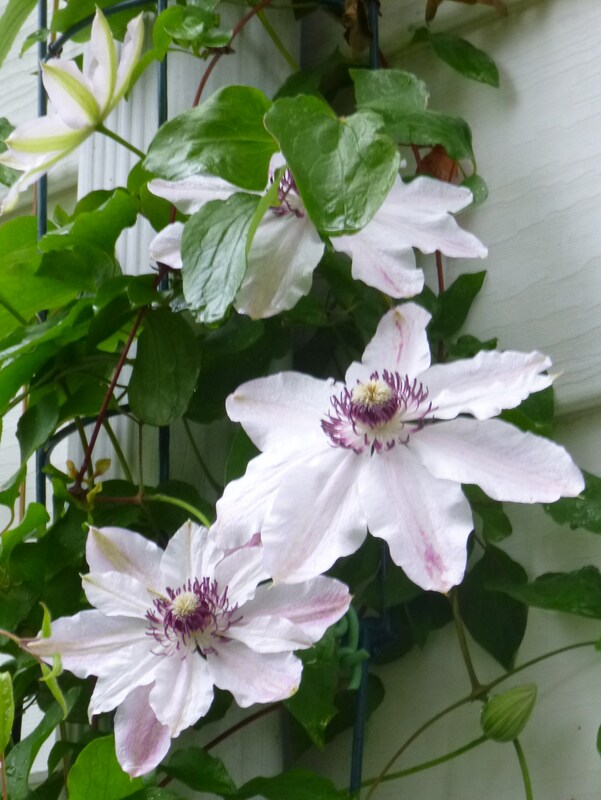 This easy-care large clematis (12-14′ vines) blooms voraciously in June, July, and part of August. 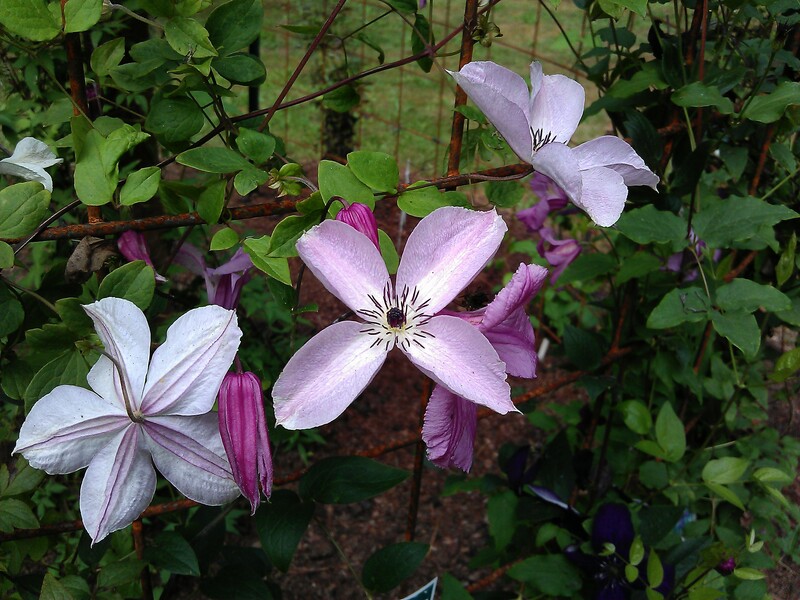 A great clematis for a beginner to try, C. Etoile Violette can be grown into a small or medium tree–mine is growing in an Italian plum tree–or on an arbor, fence, or trellis. It’s partner, C. Betty Corning, is similar in size and bloom time, plus it contrasts beautifully with C. Etoile Violette, both in color and in flower shape. The original C. Betty Corning caught the eye of Betty Corning of Albany, New York, in a neighbor’s garden in the 1920s. The plant was the result of a cross made by nature, probably with species clematis C. Crispa as one parent. Mrs. Corning accepted a cutting from her generous neighbor and, realizing it’s potential, gave a plant to a local nurseryman who got it into commerce. Now it grows all over the world. The icing on the cake about this clematis is its delightful fragrance! 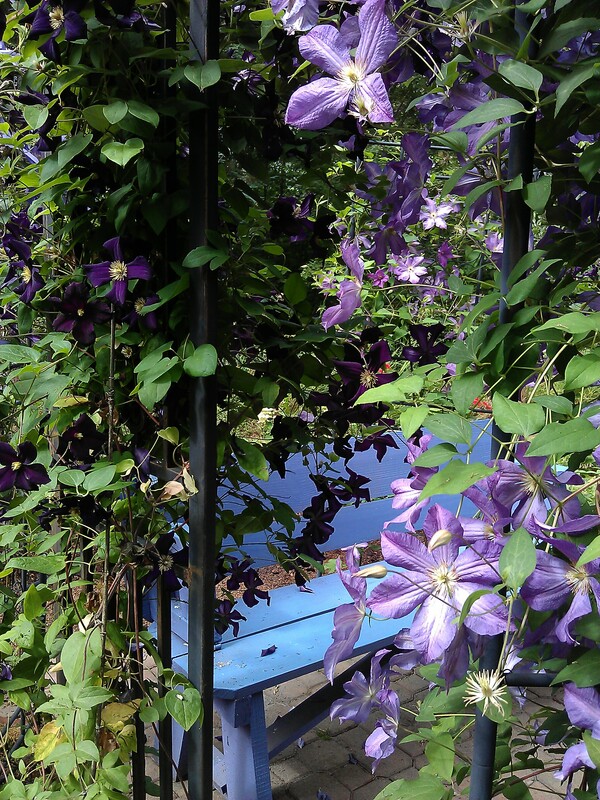 Want to see a treasure trove of hundreds of beautiful clematis all blooming at once? 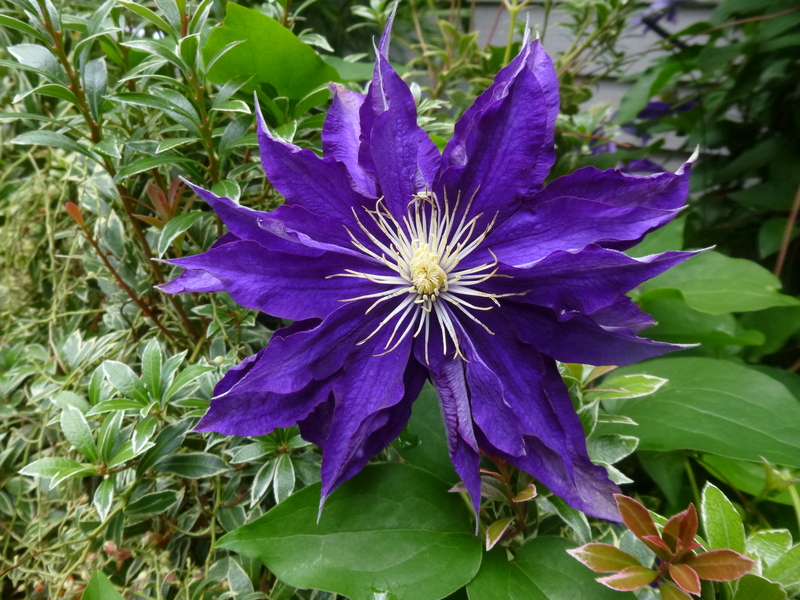 Want a chance to buy some of those beautiful clematis in person? You CAN! 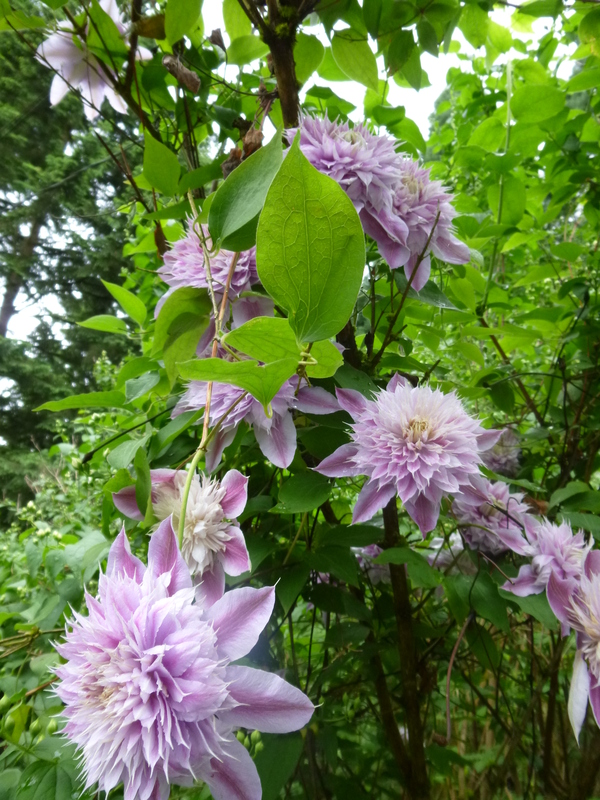 Debbie Fischer, owner of Silver Star Vinery, a mail-order source of great clematis, is hosting the second annual Silver Star Vinery Open Gardens in the beautiful foothills of the Cascades north of Vancouver, WA, on Saturday and Sunday, July 12th and 13th, from 10am – 4pm each day. 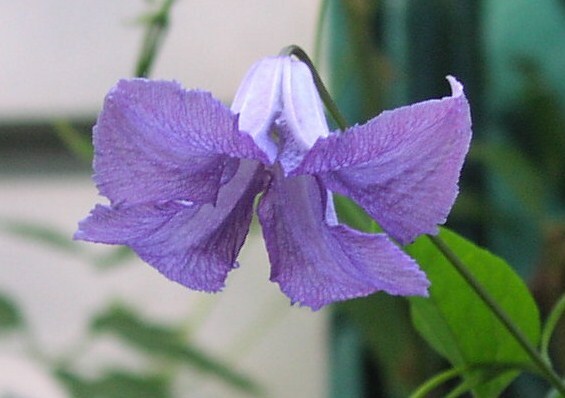 Renowned British clematis hybridizer and speaker, Roy Nunn, will give a clematis talk each day at 1pm. 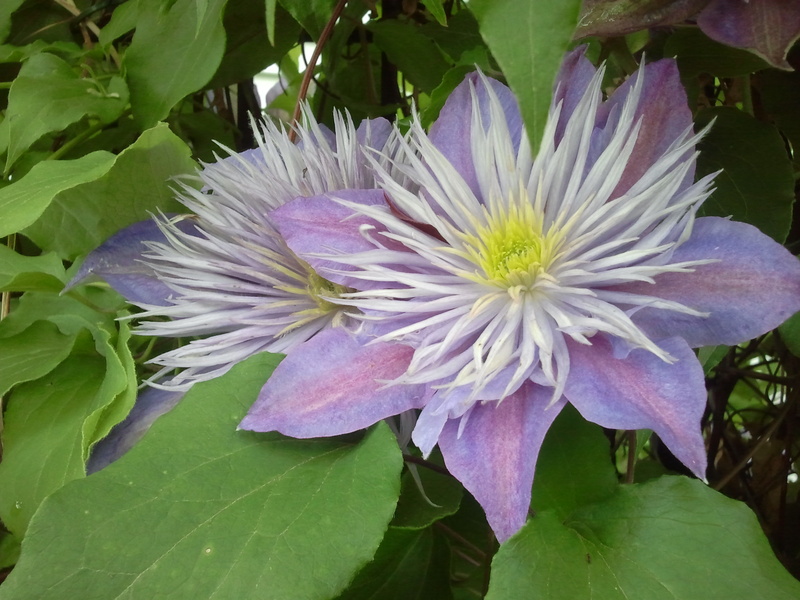 This rare opportunity to purchase clematis in person from Silver Star Vinery and to see the gorgeous display gardens is an event not to be missed! I will be there, too, in the display gardens helping to answer clematis questions. Come on DOWN. Go to the Silver Star Vinery website to get directions and more information. For a detailed description of the event in a local newspaper, The Reflector, click here. Hope to see you there this weekend! Witch Hazels’ in Bloom — Can Spring Be Far Behind? 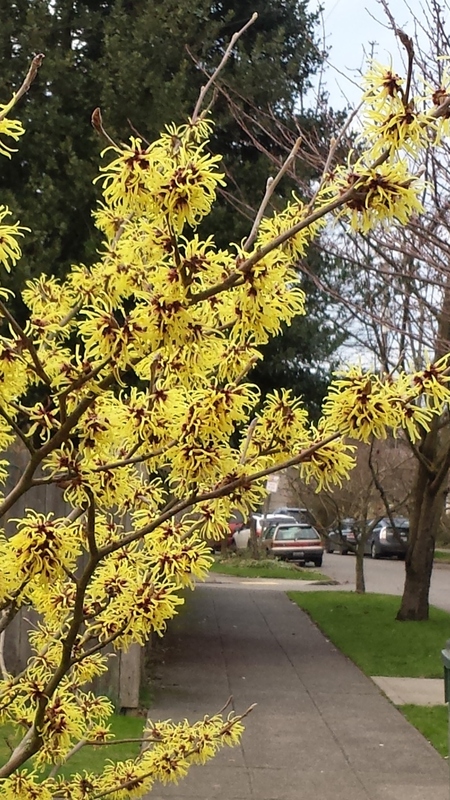 Witch hazels’ are bursting into bloom all over Seattle, warming my heart and turning my thoughts to spring. I have so many gardening chores lined up! General cleanup, adding 25 or 30 new clematis to my drip system, sifting compost, weeding, pruning, and so on and so forth and scooby dooby do dah. But it’s COLD out there! I have become such a wimp since moving to Seattle from Boston nearly 10 years ago. I just CAN’T work in the garden temperatures in the 30s any more. Of course, in Boston, I couldn’t even consider any serious gardening until late March or April — February and March are statistically the biggest snow months there. Don’t get me wrong, though, I loved living in Boston. But I love gardening in Seattle more! Zone 8-9 instead of Zone 6 and I can garden off and on all year round. When I first came here, I had no idea what half the plants in the nurseries even were. Phormium, abelia, enkianthus, choisyea, sarcoccocca–never heard of them. Hardy fuchsias? What a concept! What with flowers blooming and the Northwest Flower & Garden Show just around the corner (February 5 -9), I will have spring fever for sure! Clematis armandii Already Showing Flower Buds! 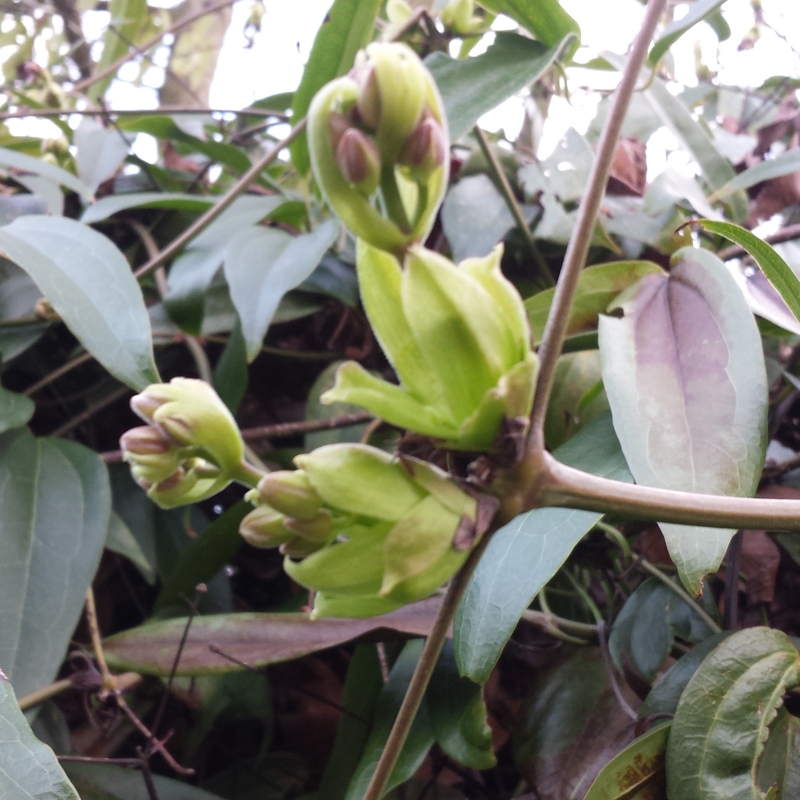 Check out the photo of the flower buds I saw yesterday on a Clematis armandii! Wooo HOOOO! Clematis recta ‘Purpurea’ — very similar to Clematis recta Serious Black. 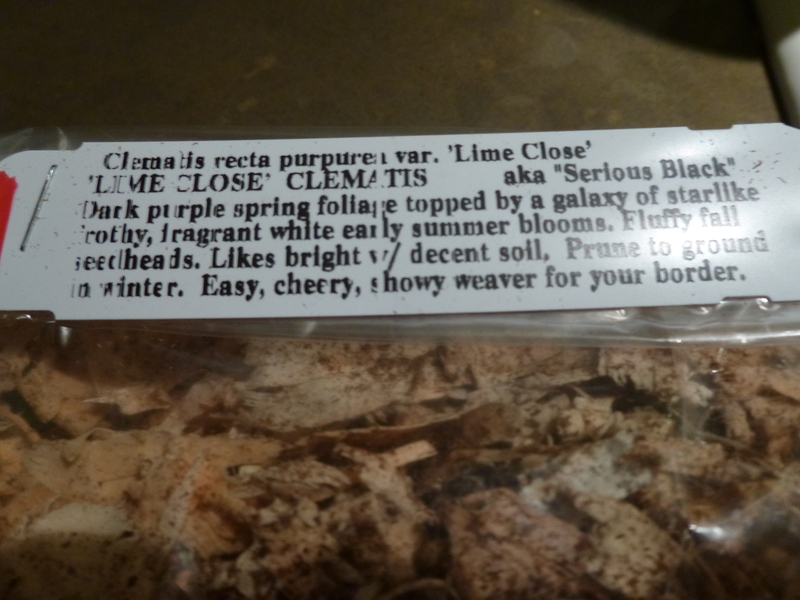 Many thanks to my reader Sarah for letting us know that Wayside Gardens is now offering Clematis recta Serious Black via mail order! You may remember that last year around this time, there was a big kerfuffle about this wonderful clematis with near-black leaves and small fragrant white flowers in summer. The plant is also known as Clematis recta Lime Close, Lime Close being the name of the garden in England where the plant was originally discovered. A small article in Fine Gardening magazine noted that this plant, a difficult one to find in the US, was available through the Northwest Perennial Alliance (NPA). Turns out that the plant was available through NPA via seed rather than as a plant. 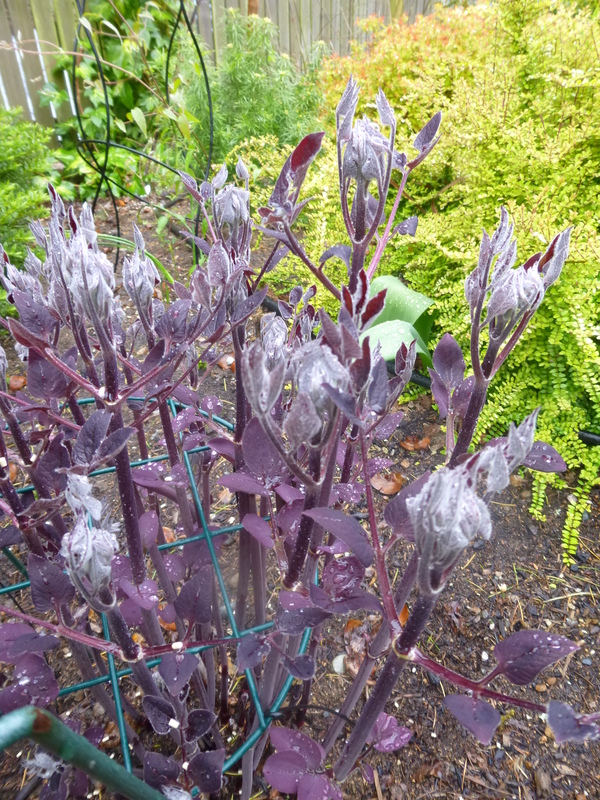 A short time later, at last year’s Northwest Flower & Garden Show, I discovered and blogged that one of the vendors there was selling bare-root versions of Clematis recta Serious Black. I think some of you were able to score one or two (I certainly did). If you didn’t get one last year, get yourself one from Wayside Gardens this year! There are so many ways that black plants can add contrast and depth to a garden. 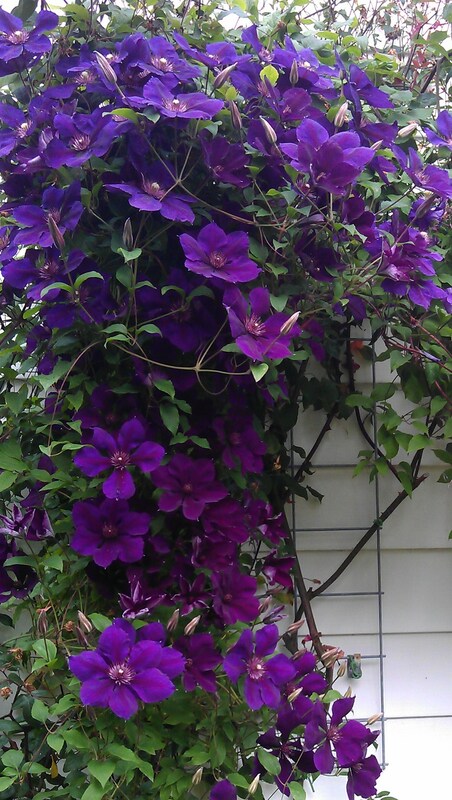 This clematis gets about 4 – 6′ tall. It doesn’t climb, so it needs support or can be allowed to scramble around and through other plants. 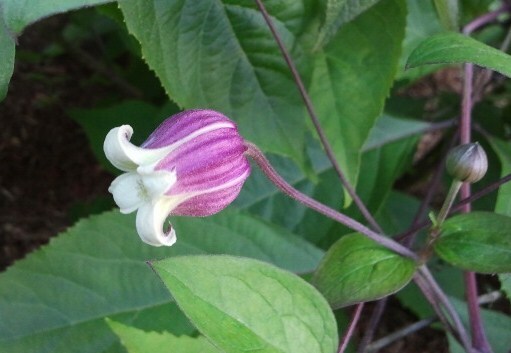 The photo here is of a very similar plant, Clematis recta purpurea. Cold damp autumn days run me indoors, giving me time to work on organizing clematis photos, peruse nursery offerings, and consider which clematis zing me the most. Many, many clematis have captured me over the years, but I would like to present here three of my all-time favorites. I simply could not be without any one of them. 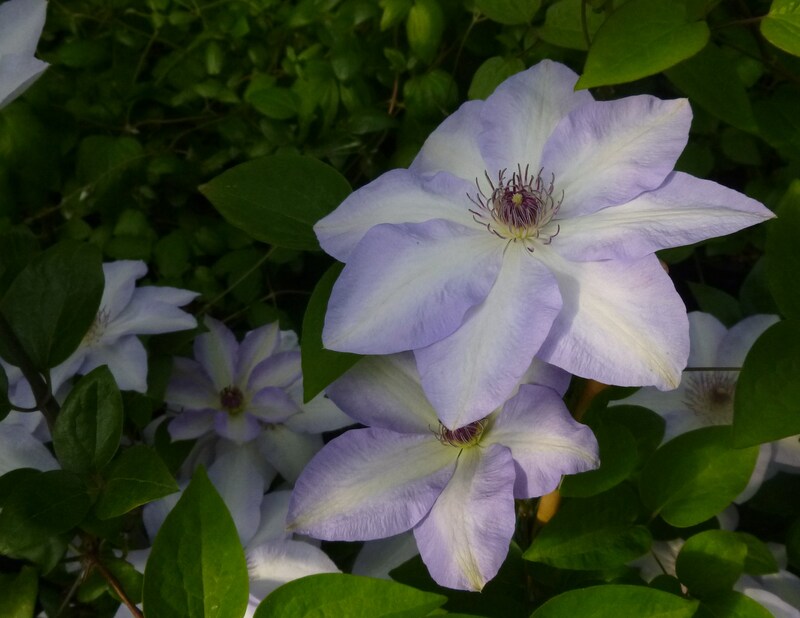 As seen in the photos above and to the right, Clematis Betty Corning, with it’s lovely bluish-mauve graceful bells and upturning tips, is a delightful sight to behold. Add a delicious scent and a long prolific blooming period and you’ve got a winner, at least in my book. 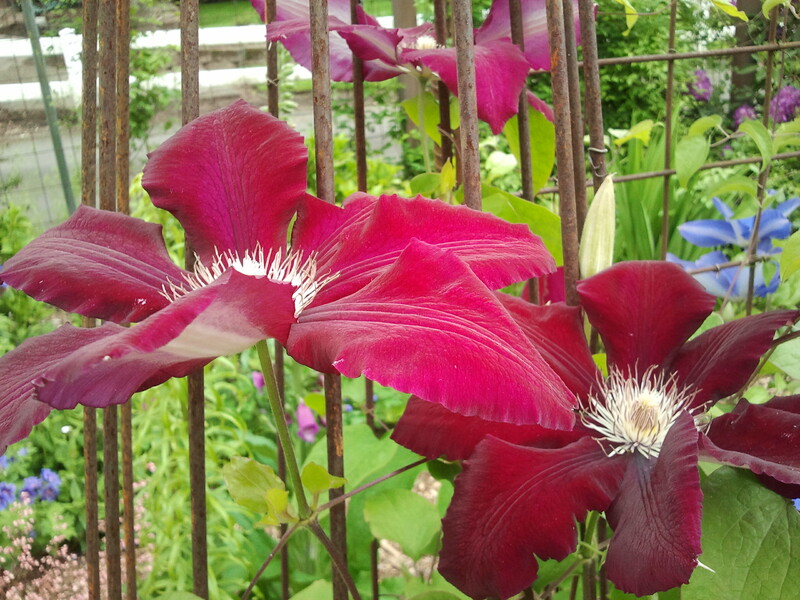 This clematis was found as a chance seedling growing in an Albany, New York, garden by Betty Corning in the 1920s. She recognized the value of this great plant and got it into the hands of someone who propagated it and got it into commerce. Lucky for us, it’s still widely available. Everyone should have one of these in the garden! Available in the US from the following excellent mail-order nurseries: Silver Star Vinery, Joy Creek Nursery, and Brushwood Nursery. Also frequently sold at local nurseries. The dark dusky blossoms of Clematis Gipsy Queen arrive for me in late summer, when many others are winding down. 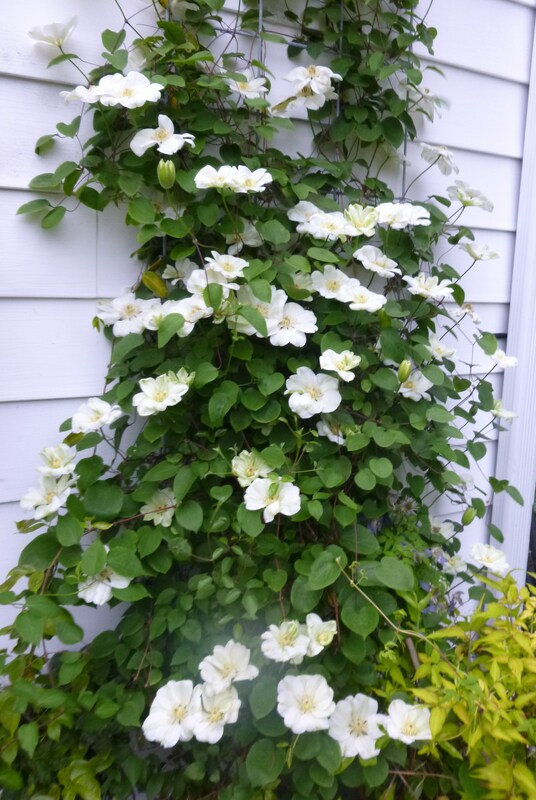 This clematis shoots up long and tall (12 feet or more) in just one season. 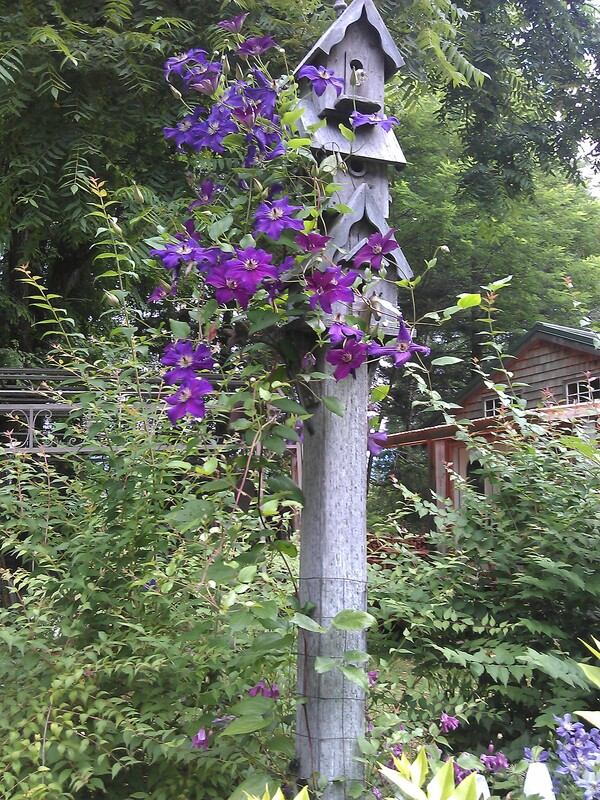 It pairs beautifully with roses, other clematis, and trees, but it also looks great on its own. The tepals separate from each other leaving an open gappy look that appeals to me. 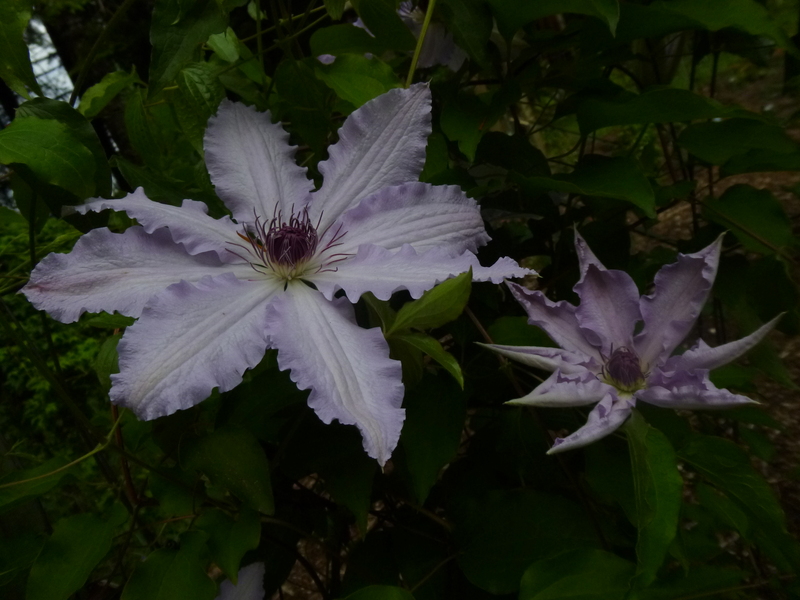 Clematis Gipsy Queen, hybridized from the famous Clematis Jackmanii in 1877, has certainly stood the test time. I just wouldn’t want to be without this one! Available in the US from Joy Creek Nursery. 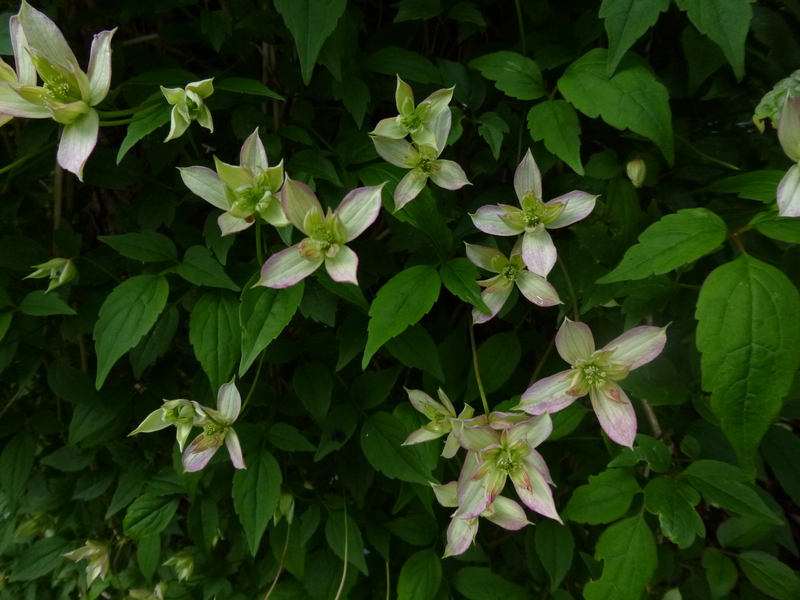 Clematis viorna is a lovely little thing. 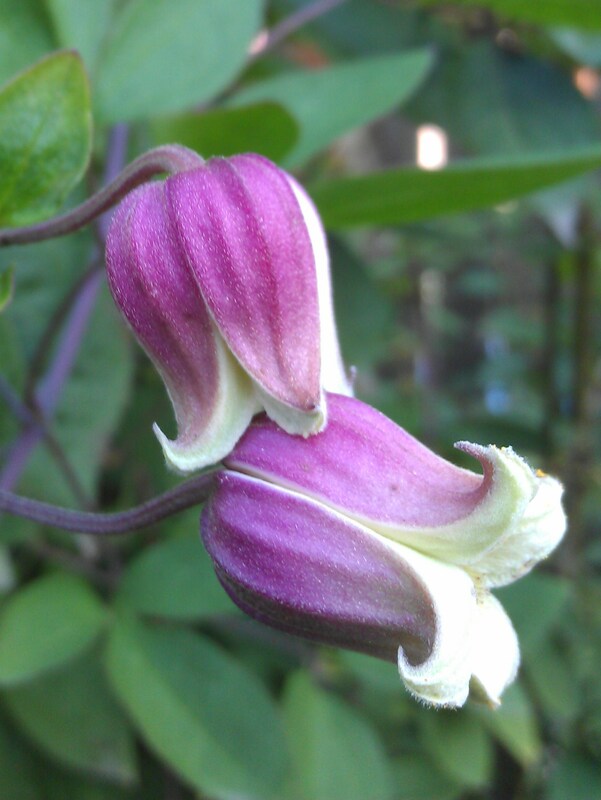 Mine blooms from June through September and is always a big hit with visitors to the garden who have never seen a clematis with small bell flowers before. The hummingbirds love it, too! 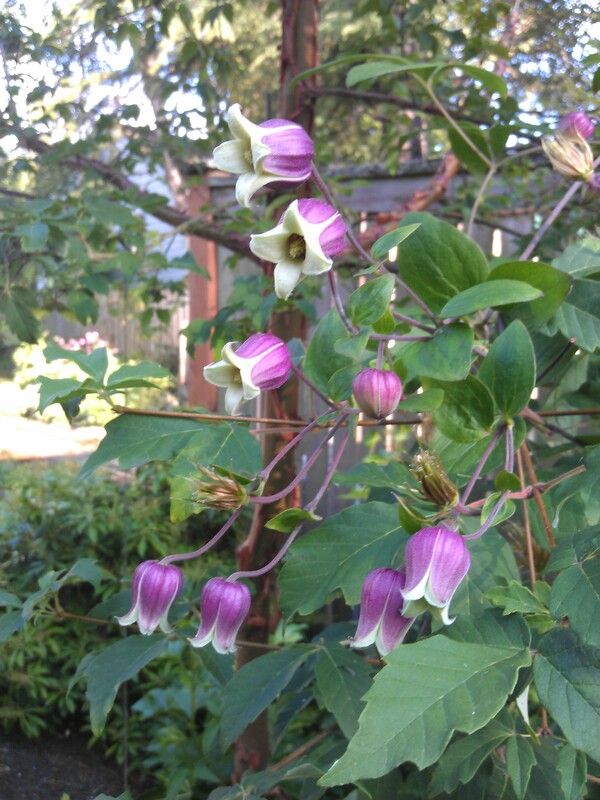 Clematis viorna can climb trees, drape trellises, and combine beautifully with a variety of plants. For example, I enjoy this one paired with beauty berry as the berries and the flowers have a similar color palette, but it looks great with a dark pink clematis like Clematis Ville de Leon, too. Clematis viorna is a native species of the southeastern United States. Available in the US from Brushwood Nursery. Silver Star Vinery, located in the foothills of the Cascades in southwestern Washington, is one of my favorite mail-order clematis nurseries. On the weekend of July 27-28, the nursery display gardens were open to the public for the first time since the Grand Opening in 2006. I had the great fortune of attending on Saturday and was able to assist owner and friend Debbie Fisher by answering questions from visitors to her huge, diverse, and beautiful display gardens. Pure heaven for a clemaniac like me! I also got to hang out with some of Debbie’s other clematis-knowledgable helpers and friends. All in all, a fabulous day, well worth the three-hour trip each way! A steady stream of visitors wandered the gardens checking out clematis and buying some of the ones that caught their fancy from Debbie, who spent most of her time in the sales area of the nursery. Delicious snacks for all comers kept everyone’s energy up. As you will easily see from the photos below, the stunning and immaculate display gardens exhibit an amazing number of clematis in bloom. The majority are displayed on wire supports in long wide rows, but many others cover arbors, embellish birdhouses on poles, and climb up wire gazebos. 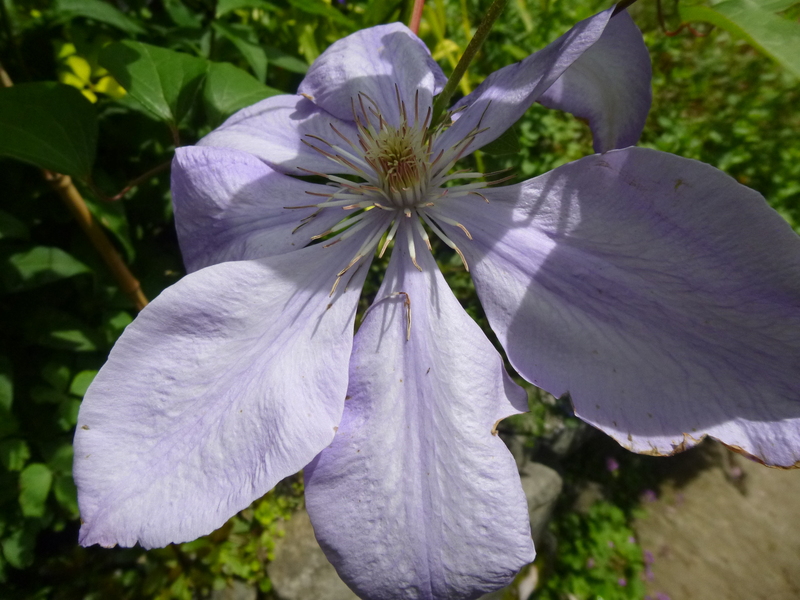 Just by wantering through the gardens, I learned so much about clematis. I saw clematis in bloom that I had heard of but never seen in person. There were many others that I was not familiar with at all. Very few clematis seedheads were visible throughout the gardens, so I asked Debbie about it. She deliberately and meticulously deadheads clematis seedheads all the time. This, along with careful watering and fertilizing, keeps many clematis in bloom for her for months! Wow. I also noticed that she and Dennis, her business partner, always have an unusual small sharp cutting tool in their hands or on their person, but I never got a chance to ask her about them. 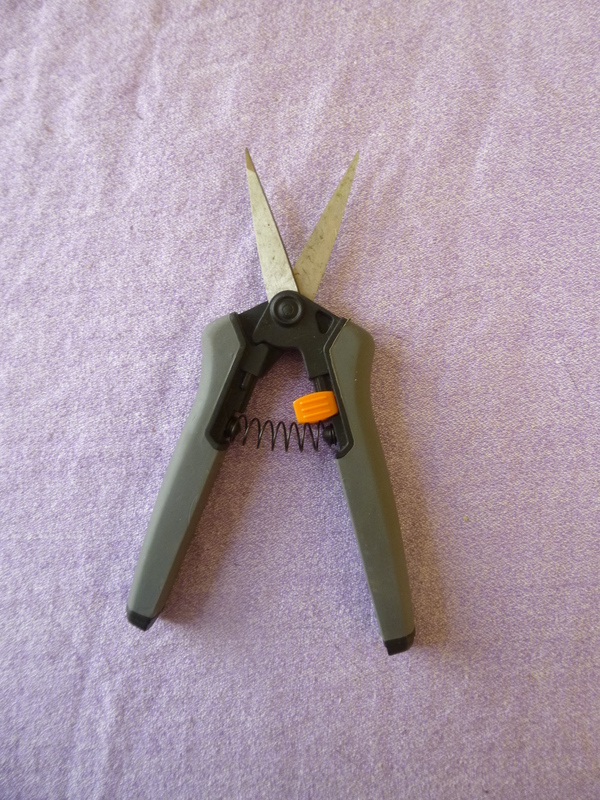 A couple of days later, when I pulled out a sewing project, I realized exactly what they use — a type of sewing scissors! Mine were immediately relegated from the sewing basket to my gardening tool belt. I’ve been using them for all kinds of deadheading ever since, to great effect. 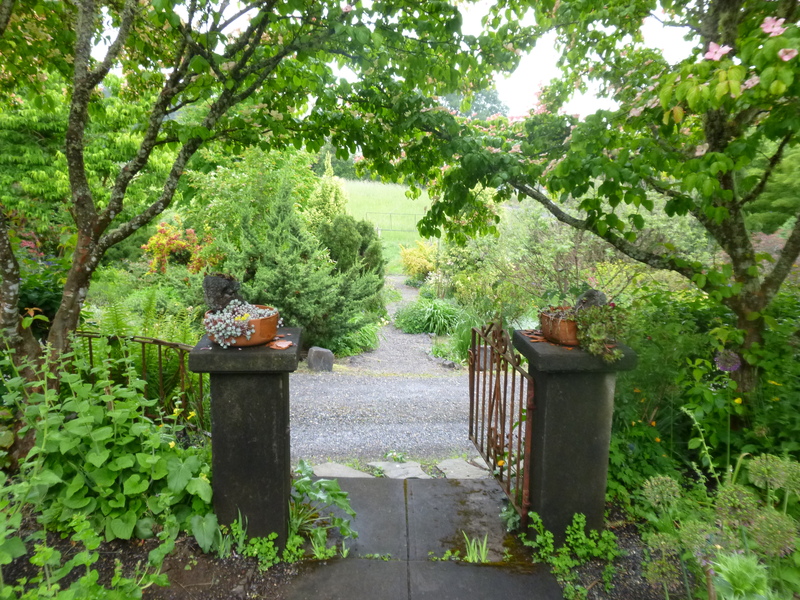 The garden open was so successful that Silver Star Vinery has already chosen the dates for next year: Saturday and Sunday, July 12-13, 2014. Mark your calendars! 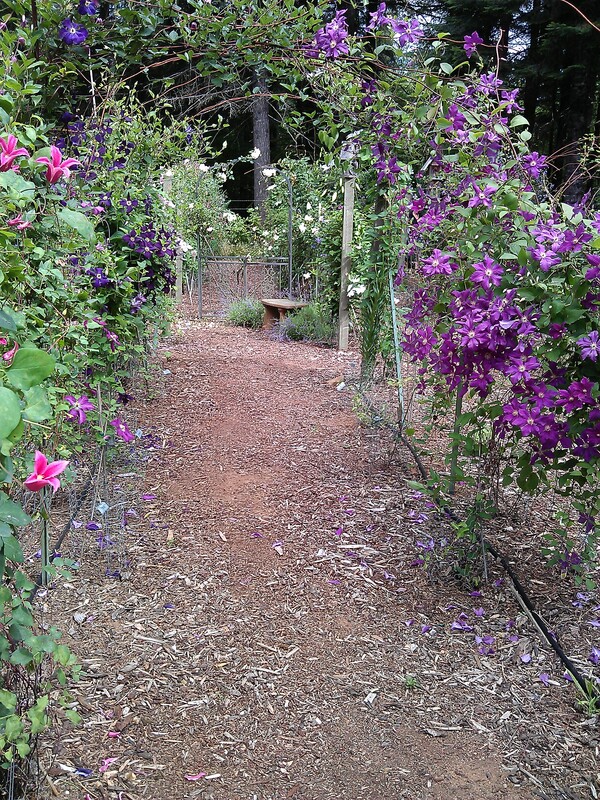 Check out the photos below of the display gardens and some of the lovely clematis I saw there. Last weekend, my husband and I drove down to Portland for a few days to relax, eat well, and just enjoy ourselves! For me, of course, that includes CLEMATIS! 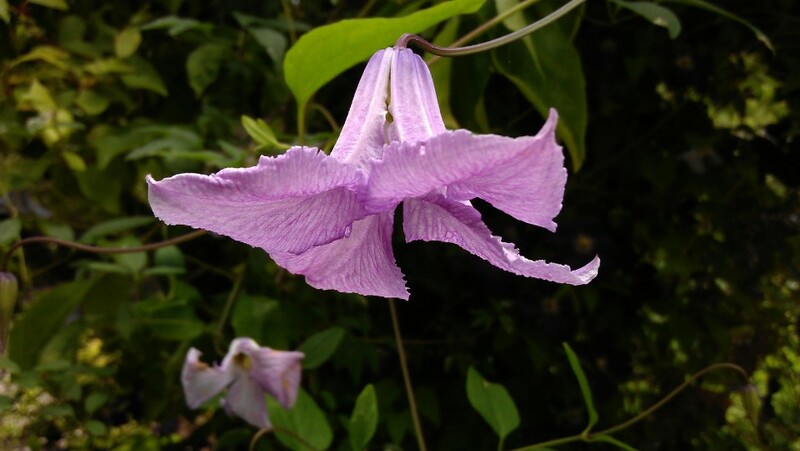 We visited Joy Creek Nursery, enjoyed an Inviting Vines Garden Tour of five lovely Portland gardens, checked out the fabulous gardens of the Rogerson Clematis Collection, and topped it all off with a special visit to Silver Star Vinery (a great mail-order source for clematis). On Friday after a delicious deli breakfast across from our hotel, we drove a few miles north to Joy Creek Nursery in Scappose. They had plenty of clems in stock, making deciding which ones I need quite a chore. In the end, I settled on two. 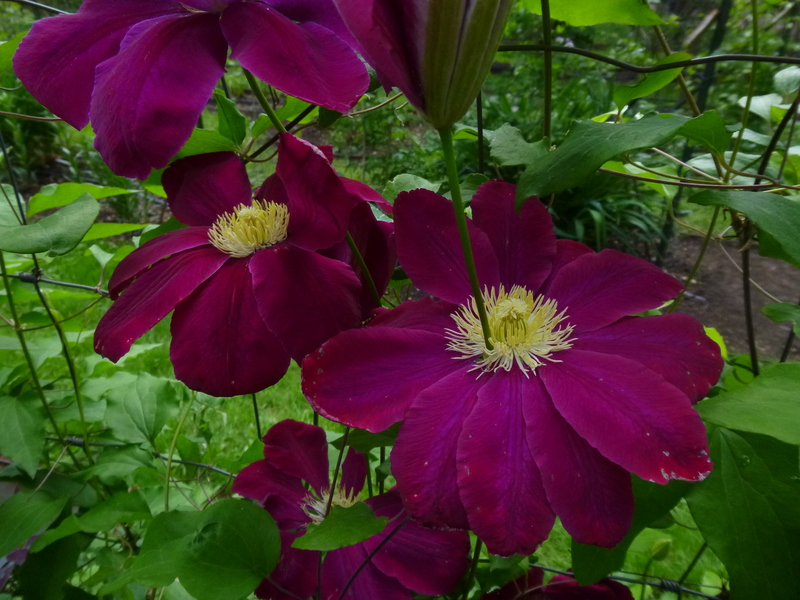 The first is Clematis ‘Cassis’, a small reddish-purple double, with Clematis florida in its background–it was pictured on the tag as a luscious dark purple double. But when I looked it up on Clematis on the Web, I found it looks like this! Geesh, I like the first look better! Guess I’ll have to wait and see what I get. The other one I bought was Clematis heracleifolia ‘Cassandra’, which represents my first foray into the perennial clematis with highly fragrant hyacinth-shaped blooms. While at Joy Creek, we picked up our tickets to the Rogerson Clematis Collection’s fundraiser, Inviting Vines Garden Tour, for the next day. 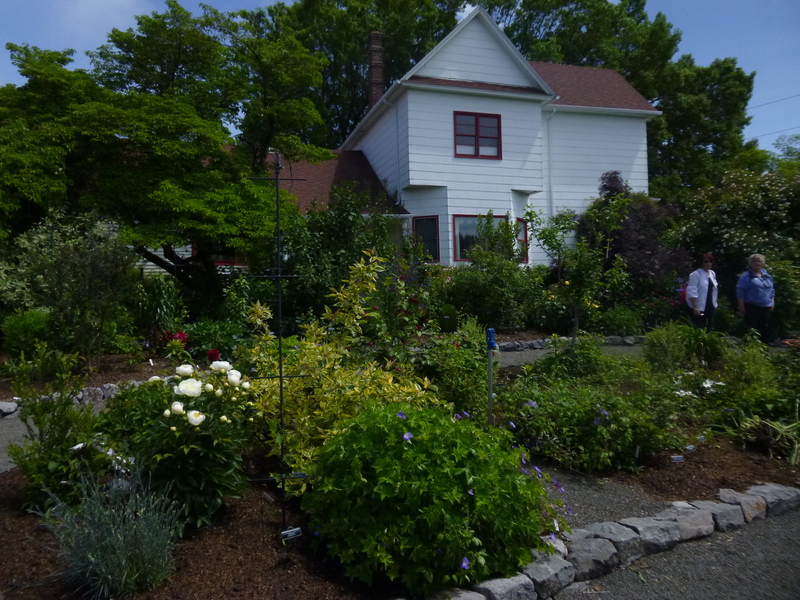 On the way back to Portland, we made a stop at Cistus Nursery on Sauvie Island – this is a nursery with wonderful plants, though, alas, not much in the way of clematis. They had only Clematis fasciculaflora–a winter bloomer, Clematis cartmanii Joe–a New Zealander, and a Clematis tanguitica (yellow bells). I didn’t need any of those. Nevertheless, several other plants from Cistus made the trip home with us. This annual garden tour orchestrated by the Rogerson Clematis Collection showcased five gardens, each one beautiful and unique, and all with clematis artfully incorporated. 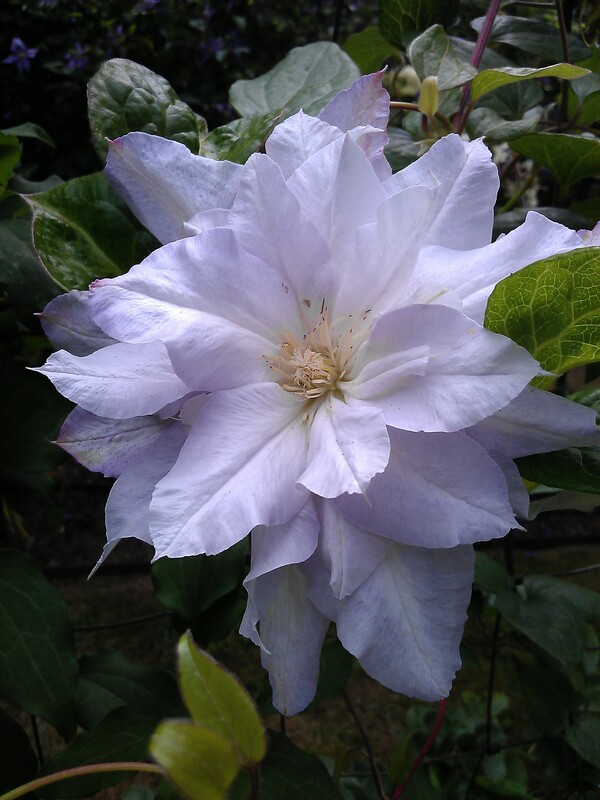 I saw a beautiful Clematis Josephine high up in a tree, an intensely blue Clematis Hakuoonan, and many others. 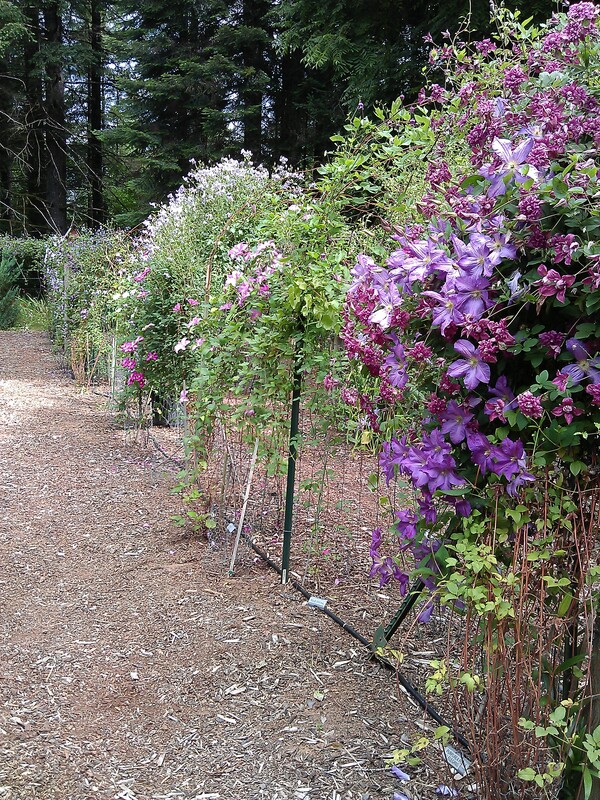 Our last stop on the tour was a visit to the Rogerson Clematis Collection (RCC) at Luscher Farm in Lake Oswego. What a treat! I am so impressed with how RCC has designed the gardens to enhance the ambiance of the old farmhouse as well as to showcase clematis and how to use them in a garden setting. Never fear, this is no clematis monoscape; rather, clematis are artfully blended with diverse and interesting plants and structures. A cadre of RCC volunteers, as well as curator Linda Beutler, were on hand to answer questions, sell unusual clematis from the nursery, and provide tours of the many gardens. Admission is free year-round! Would you be surprised to learn that three new clematis from Luscher Farm came home with me? Well, they did: Clematis uncinata (a late-summer-blooming evergreen clematis with small white fragrant flowers), Clematis tibetana subsp vernayi var laciniifolia (orange bells with maroon stamens, also blooming in late summer), and Clematis ‘Jerzy Popieluszko’, a large-flowered Polish clematis with lovely big white blossoms on a short plant that should work well in a pot. Silver Star Vinery is a wonderful mail-order clematis source nestled in the foothills of the Cascades northeast of Vancouver, Washington. Debbie Fisher, owner and head bottle washer (er, I mean head clematis tender), invited us to stop by on our way home from Portland. How could we refuse? This is a nursery that is not generally open to the public, even though Debbie has a humungous display garden filled to the brim with an amazing variety of healthy and beautiful clematis vines. Ahhhhhh. We arrived after a long and lovely drive from the highway up into the hills alongside a meandering stream. Debbie and her fellow clematis tenders, Dennis and Doug, met us at the gate. We wandered through the gardens with Debbie, who is a font of knowledge about clematis. 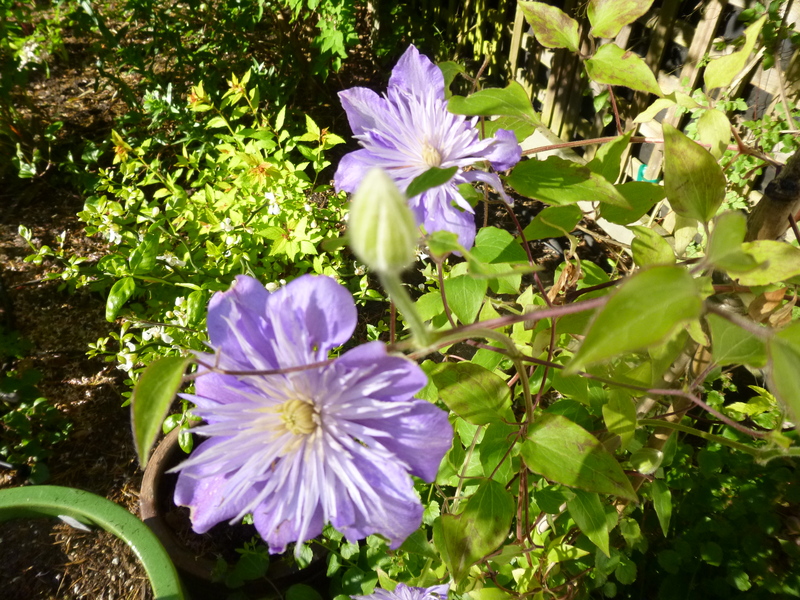 Below are a few of the clematis we saw in bloom there–the Clematis Multi-Blue came home with us. I know it’s late notice, but . . .
Clematis Garden Tour in Portland! Where: five gardens in SW Portland, as well as the Rogerson Clematis Collection’s clematis display gardens and nursery nearby at Luscher Farm in Lake Oswego. Click here for more info, including how to get tickets. I am so sorry that I didn’t tell you all sooner about this! My life has been crazy lately. I attend the fabulous Rogerson Clematis tour every year — it’s always on the Saturday of Memorial Day Weekend. Attendees see gorgeous gardens that demonstrate how to use clematis effectively in home garden situations. 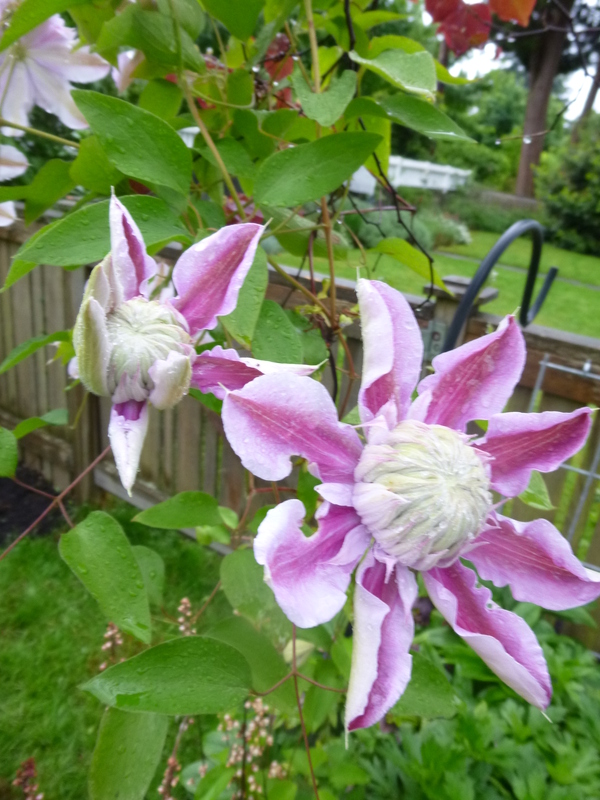 Plus the Rogerson Clematis Collection (in Lake Oswego, just south of Portland) will be selling clematis — and, believe me, they have some unusual ones! One of the gardens will also be selling plants. And, if you have time, both Joy Creek Nursery and Cistus Nursery are nearby. So if you don’t have anything planned for Saturday, make it a day trip, or even stay overnight in Portland. I am!! 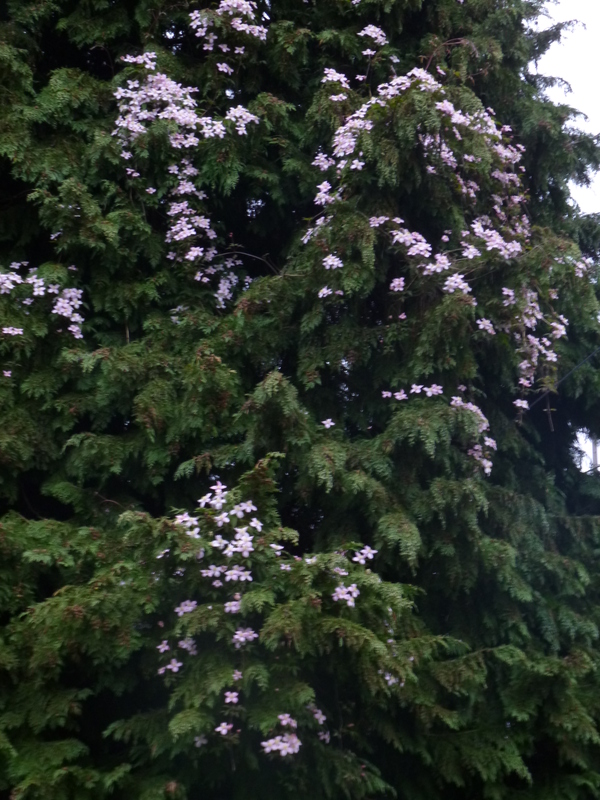 Clematis montana Vera — 40′ up a 90′ Port Orford Cedar! 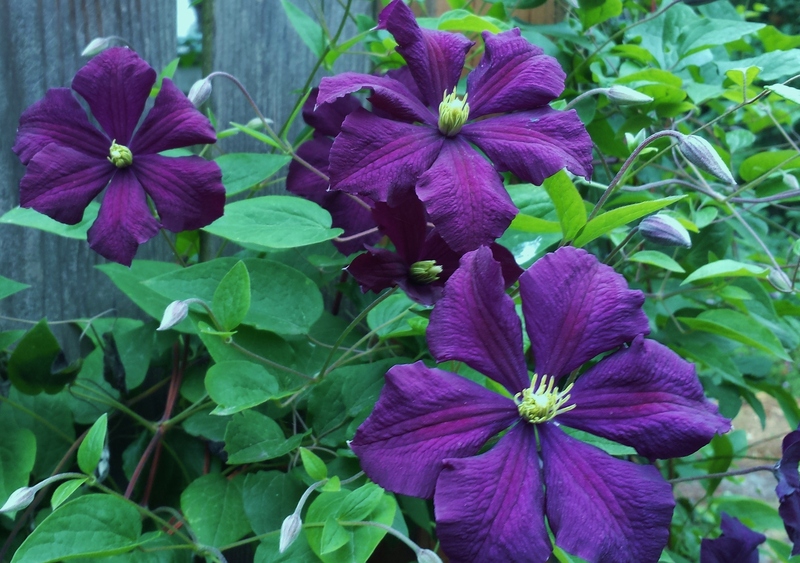 News Flash: Clematis Serious Black FOUND! Update! If you didn’t get a chance to get to the Northwest Flower & Garden Show in February to pick up your own Clematis Serious Black, all is not lost! 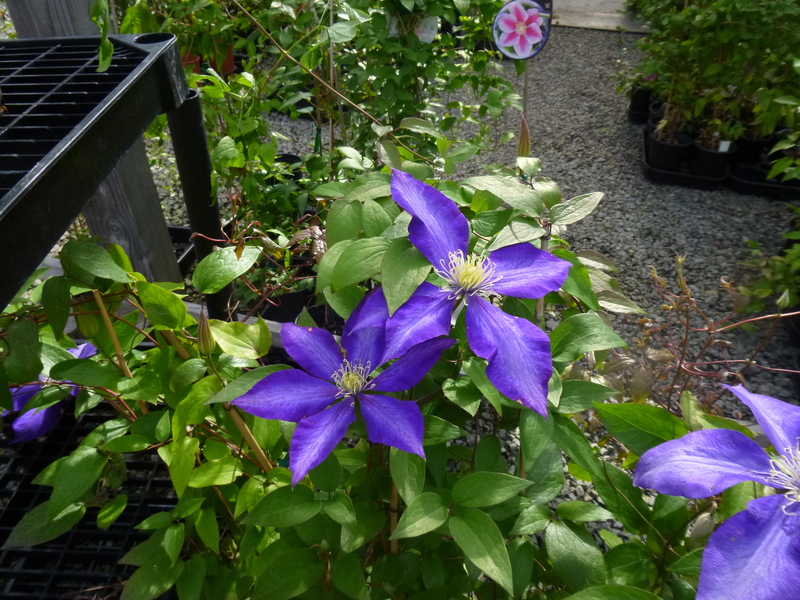 Nils Sundquist of Sundquist Nursery — the nursery that was selling Clematis Serious Black at the Show — will also be selling this plant at his Garden Opens on the Kitsap Penninsula. See Nis’ comment below! While wandering around the Northwest Flower & Garden Show today, enjoying the sites and feeding my need for spring, I asked each of the plant vendors I ran up on whether they carried clematis. 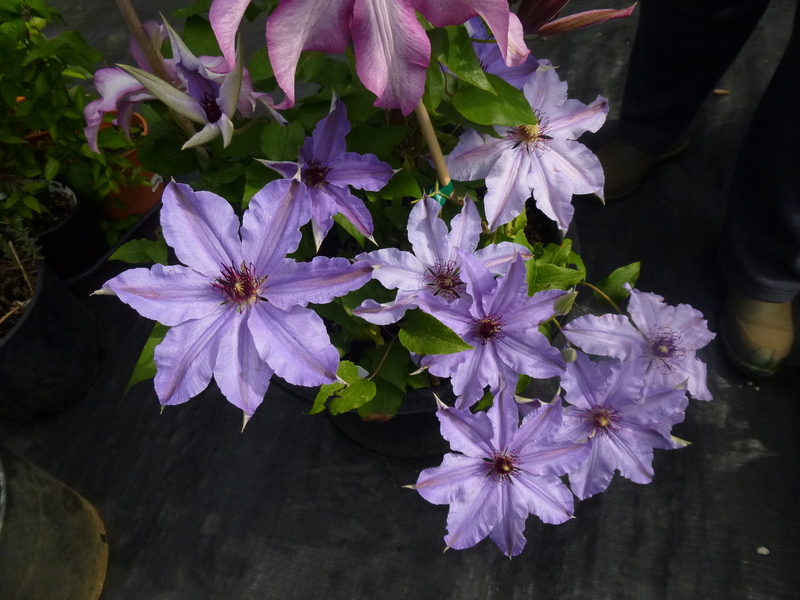 Several were selling Clematis armandii and one even had a couple of New Zealand clematis. But when I stopped by Sundquist Nursery late in the day, I hit PAYDIRT! Sundquist Nursery is selling bare-root plants of — drum roll, please — Clematis recta ‘Lime Close’, aka Clematis Serious Black! Oh, those lovely little roots! 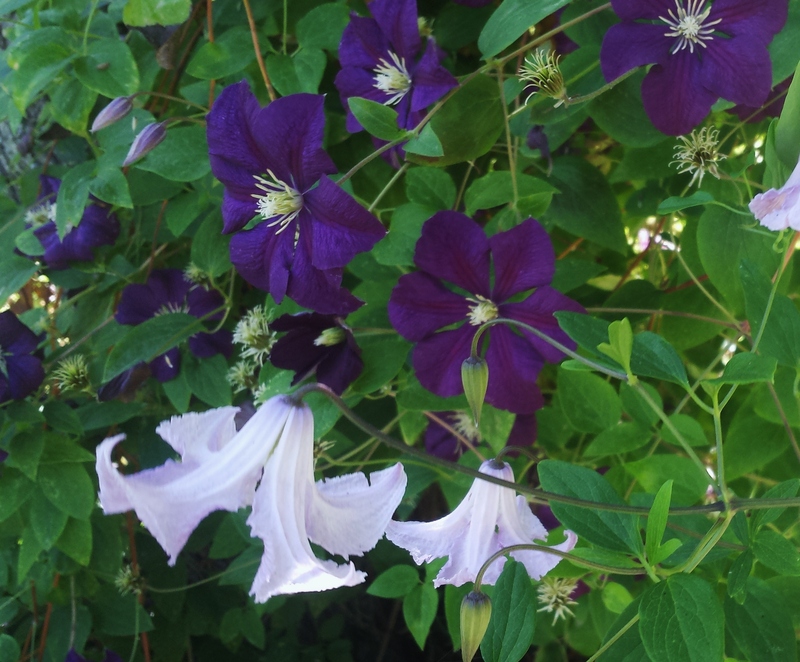 To learn more about this very interesting non-climbing clematis that sports black (well, almost black) leaves, see my earlier post on the subject. Clematis Serious Black was recently featured in Fine Gardening magazine, but the source mentioned for the plant (the Northwest Perennial Alliance) carries only seed. As luck would have it, if you can get yourself (or send a friend) to the Flower Show between now and Sunday (2/24) at the Convention Center in downtown Seattle, you too can have a bare-root plant of Clematis Serious Black of your very own (I already bought mine!). $12!!! The box I found mine in seemed to have 15 or 20 more, so hurry on down! Now let’s turn to the third, but most definitely not the least, of my three favorite mail-order nurseries for clematis, Brushwood Nursery. Brushwood is all about vines–climbing roses, passion flowers, trumpet vines, honeysuckles, and loads of — you got it — CLEMATIS! 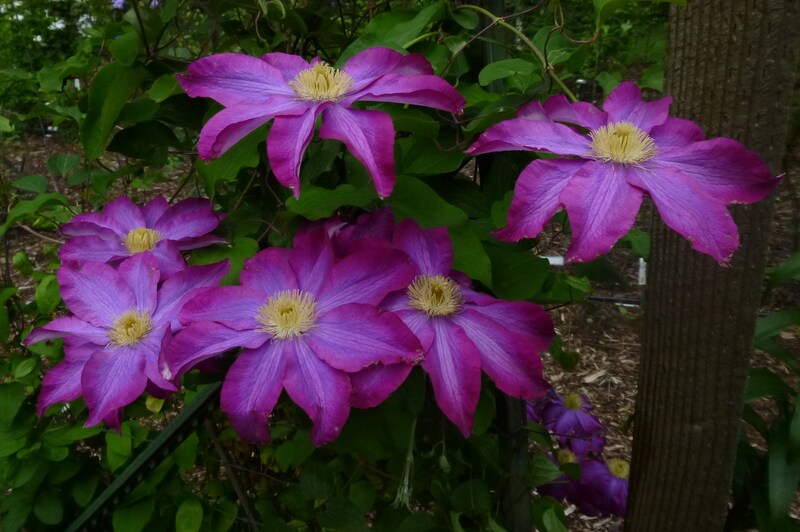 Dan Long, proprietor of Brushwood Nursery and a member of the International Clematis Society, has connections throughout the world that allow him to offer a wide variety of large-flowered, small-flowered, and non-vining clematis. He offers over 350 varieties, though many are already unavailable until he replenishes his stock. But many others are currently on sale!! 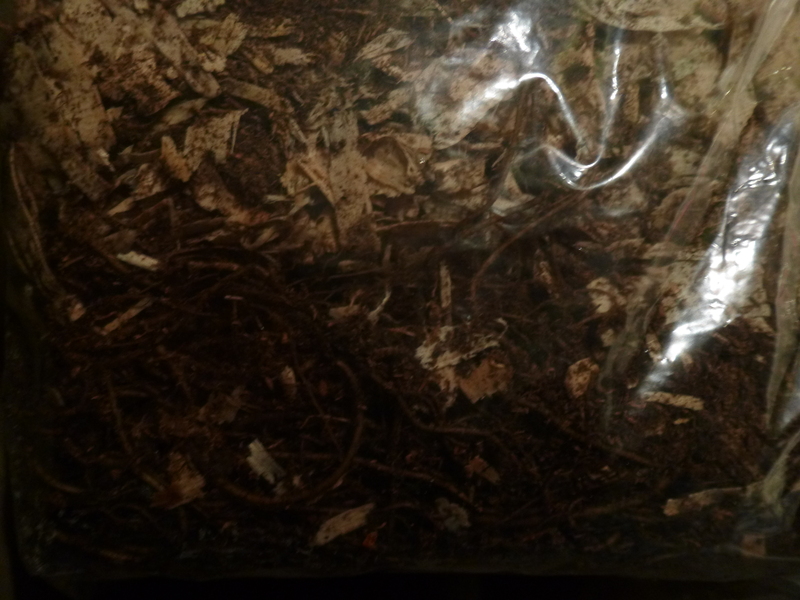 In my experience, plants ordered from Brushwood take off and grow well. Once of my personal favorites from Brushwood is my huge species clematis, Clematis viorna (huge as in big plant — flowers are only about an inch long). Its blooms are dainty though sturdy little bells with pert tips that recurve like a jester’s belled slippers. I planted this lavendar and white clematis to grow through a Calicarpa (Beauty Berry). It starts blooming in July and continues to bloom until the beauty berry produces its delicate and lovely lavendar berries. The two look wonderful together. Argh! I haven’t taken an aceptable photo of the pairing yet. Two of the many beautiful and unusual clematis Dan offers include Clematis Crystal Fountain (also known as Clematis Fairy Blue’), which is a lovely double, and Clematis Rebecca, one of the most beautiful of red clematis. Photos below.